The SeaWolves held the lead for 26 outs on Wednesday night at FNB Field, only to fall to the Harrisburg Senators 5-4 in walk-off fashion. The loss was Erie's fifth consecutive. Erie struck first against Harrisburg starter Logan Darnell in the top of the fourth inning. Isaac Paredes led off with a double and scored on a Dominic Ficociello base hit for a 1-0 lead. The 'Wolves extended their lead in the fifth. Will Maddox led off with a single, moved to second on a Cam Gibson sacrifice bunt and stole third base. Danny Woodrow followed with a walk putting runners on the corners for Sergio Alcantara. Alcantara singled home Maddox making it 2-0. Willi Castro followed with a base hit to load the bases. Paredes drew a bases-loaded walk, scoring Woodrow for a 3-0 lead. Harrisburg got on the board in the seventh against Erie reliever Nolan Blackwood when Drew Ward connected on an opposite-field solo home run, his 12th, to make it 3-1. The Senators cut into the Erie lead once again in the last of the eighth against Blackwood. Osvaldo Abreau led off with a double and Carter Kieboom walked with one out bringing the tying run to the plate. Daniel Johnson hit into a fielder's choice but the 'Wolves could not turn two. Erie then summoned John Schrieber to face Raudy Read. Read singled home Abreau making it 4-2. Harrisburg then completed the comeback in the last of the ninth inning against Schreiber. Austin Davidson led off with a double and scored on a two-out Abreau single to make it a 4-3 game. Alec Keller singled to put the winning run on base. Kieboom then shot a double to the gap in left-center, plating both baserunners for the Senators win. Bryan Harper (2-1) earned the win for Harrisburg tossing 1.1 scoreless frames. Schreiber (3-7) took the loss for Erie allowing three runs on five hits with no walks and two strikeouts in 1.1 innings. 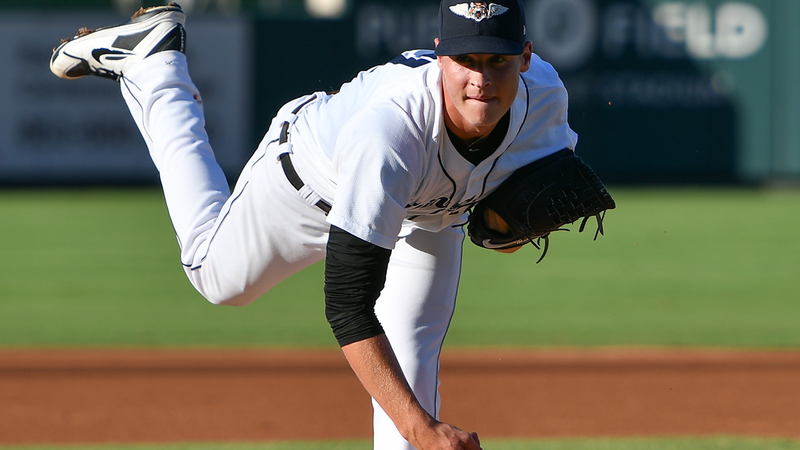 Erie starter Matt Manning dazzled in his Double-A debut in a no-decision effort. The 2016 first rounder hurled six scoreless innings, allowing three hits with a walk and eight strikeouts. He finished his outing striking out four of the final six hitters he faced. The SeaWolves will look to avoid the sweep on Thursday night at FNB Field at 7 p.m. Right Alex Faedo (2-6, 4.91 ERA) takes the mound for the SeaWolves against RHP Wil Crowe (0-4, 5.32 ERA).